600 million years ago – The region encompassing Organ Pipe Cactus National Monument formed on the southern continental margin of nascent North America. 250 to 25 million years ago – The pacific plate subducted beneath the western North American plate, setting the stage for volcanic eruptions east of the fault line. 25 to 15 million years ago – The Middle Tertiary period witnessed a particularly violent string of volcanic eruptions through southwestern Arizona. 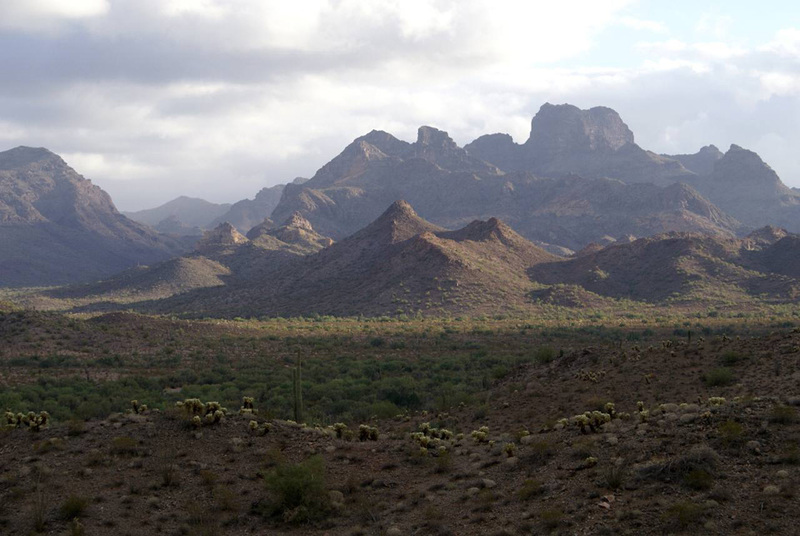 These events would form the landforms we see in Organ Pipe Cactus National Monument today: the Ajo Mountains, rounded hills, and rock formations. 1000 BCE – Hohokam society began forming, as groups of people coalesced and practiced agriculture. 1533 – The Yaqui Indians first saw first Europeans, a group of Spanish explorers searching for slaves. 1583 – Antonio de Espejo, a Spanish explorer, led nine soldiers through this region searching for precious metals. Espejo returned safely, finding several potential mining areas, but none were of enough significance to lure the viceroyalty of Mexico to allocate scarce resources into an area so far out on the colony’s northern frontier. 1540 – Francico Vásquez de Coronado, the first Spanish conquistador to explore the area passed through Southern Arizona. 1613 –The Yaqui Indians came to an agreement with the Spaniards, opening the door of the northern Sonoran region to missionaries. 1698 – Spanish explorer Father Eusebio Kino discovered Quitobaquito Springs, a rare occurrence of surface water inside what is now Organ Pipe Cactus National Monument. The spring had been used for thousands of years by native peoples and had been historically important for people travelling through the area before western development. 1736 – Discovery of silver in the area. 1751 – Pimas and Tohono O’odham in the area rebelled against Europeans and caused widespread damage. 1767 – King Charles III of Spain expelled the Jesuits from all Spanish owned lands, ending the formal missionary effort in the northern Sonora region. 1821 – Mexico gained independence from Spain. 1848 – Mexican-American War ended, ceding much of modern Arizona to the U.S.
1849-1851 – 60,000 Forty-niners passed through Arizona using the Gila River on their way to California. 1853 – The Gadsden Purchase added much of southern Arizona to the U.S.
1854 – The first claim was put on the Ajo mine, ten miles north of future Organ Pipe Cactus National Monument. 1856 – Samuel P. Heintzelman formed a partnership with other Arizona newcomers and incorporated the Sonora Exploring and Mining Company in Cincinnati. 1863 – John Goodwin, the first governor of the newly established territory of Arizona, took office. 1866-1870 – The U.S. Army conducted 137 skirmishes against Native Americans in Arizona and counted 649 Indians dead. 1868 – 600 Yaqui men, women, and children were captured near Vahkom Pueblo by Mexican state and federal troops. Their arms were taken, and 450 were locked in a church. During the night, the church was shelled. 120 of the people inside were massacred. 1881 – The arrival of the Southern Pacific Railroad through Tucson. This made southern Arizona an attractive location for large-scale commercial ranching and linked it to the national economy. 1882 – May 6, the Chinese Exclusion Act limited Chinese immigration to the U.S.
1904 – Mounted guards were formed in order to protect the U.S.-Mexico border. 1906 – The Antiquities Act was signed into law by Theodore Roosevelt on June 8. The Act gave the President the right, by executive order, to restrict the use of certain public land, which is owned by the federal government. 1915 – Congress authorized mounted inspectors who had more authority to make arrests alongside the border. 1916 – The Organic Act was passed. The Organic Act established the National Park Service as an agency under the direction of the Secretary of the Interior with the stated purpose of promoting use of national park lands while protecting them from impairment. 1919 – Robert Louis Gray bought three hundred cattle and the Rattlesnake Ranch from Lonald Blankenship, renaming it Dos Lomitas. This was the first large-scale ranching operation on land now in Organ Pipe Cactus National Monument. 1924 – The United States Border Patrol was officially formed on May 28. 1937 – Under the presidential powers of the Antiquities Act, President Franklin D. Roosevelt created the Organ Pipe Cactus National Monument on April 13. 1937 – The creation of the Papago Tribe (later changed to the Tohono O’odham Nation) and the ratification of a tribal constitution and by-laws that gave power to an elected tribal council that consisted of members from the Papago, San Xavier, and Gila Bend Reservations. 1937 – Ranching and grazing within Organ Pipe Cactus National Monument banned. 1939 – The Gray family received a permit to graze 500 head of cattle on the monument, the first of several more permits which would eventually allow over 1500 cattle to be grazed on the monument. 1942 – The Bracero Program began in the border region of the United States. 1943 – Weather and climate record-keeping began for Organ Pipe Cactus National Monument. 1957 – Sahara Mustard, an invasive plant, began spreading throughout the Sonoran Desert. 1969 – Operation Intercept-crackdown on border initiated by President Nixon. 1970 – Congress passed the National Environment Policy Act (NEPA). 1976 – Organ Pipe Cactus National Monument was designated a UNESCO Man and the Biosphere Reserve. 1976 – September – Congress repealed the 1941 law allowing for unrestricted mining on the monument. 1978– The Victoria mine was added to the National Register, at the state level, as one of the oldest known examples of mining immediately adjacent to the US/Mexican border in southwestern Arizona. 1980 – Copper mining and smelting in the area around Organ Pipe Cactus National Monument ceased. 1983 – Tropical storm Octave washed away a section of Interstate 10 between Phoenix and Tucson, Arizona. 1994 – North American Free Trade Agreement (NAFTA) passed. 1994 – Border Patrol Strategic Plan for 1994 and beyond implemented (Operation Gatekeeper, Operation Safeguard, Operation Hold the Line). 2002 – Organ Pipe Cactus National Monument ranger Kris Eggle was tragically killed while in the pursuit of drug smugglers. 2003 – Surface water in the monument tested very high for E. coli contamination. 2003 – Immigration and Naturalization Services (INS) decommissioned and the border patrol became a part of CBP, U.S. Citizenship and Immigration Services, and U.S. Immigration and Customs Enforcement. 2004 – The humanitarian organization No More Deaths was founded. 2005 – A twenty-mile stretch of vehicle barrier fence was completed by the National Park Service in Organ Pipe Cactus National Monument along the international border. 2005 – Congress passed the “Real-ID” Act, allowing for the waiver of environmental regulations when constructing an international boundary fence. 2006 – October – Congress passed the Secure Fence Act, calling for over 700 miles of new fencing along the U.S.-Mexico border. 2006 – Pedestrian barrier fence was erected along part of the international boundary in Organ Pipe Cactus National Monument. 2007 – Primary construction on the border fence in Organ Pipe Cactus National Monument. 2008 – July 12 – A rainstorm dumped two inches of rain within the span of ninety minutes, causing severe flooding along the international boundary fence and through the Lukeville/Sonoyta border checkpoint. 2008 – Pilot virtual fence project completed by Boeing. 2010 – Monument Superintendent Lee Baiza’s Report on Natural Resource Vital Signs indicated that the U.S.-Mexico border situation was the most difficult issue facing the monument. 2010 – The U.S. Army Corps of Engineers installed retractable gates along the international boundary pedestrian fence in an attempt to improve emergency flood drainage. 2011 – November – The Desert Bighorn Sheep was removed from the endangered species list by the New Mexico Department of Fish and Game.